Quilt Marking came up as a topic on OST last week, Val talked about how she did it .. She uses the quilter’s paper for her marking .. She told us that she would print out on one sheet the pattern, stack the other sheets together (which she cut down to size first), then would stitch thru the sheets and have a template to follow for her quilting .. well it occurred to me that maybe you could do it with tissue paper! Granted you would have to be careful, but i thought it would be possible .. so tonite I set out to test this theory .. I decided to try the Michigan Left as it’s basted and already has the borders stitched down. So this would be perfect to do as I didn’t have to do anything else with it 😉 I LIKED that idea!! I didn’t really want to bother with printing on tissue paper as that involves stabilizing the paper with card stock, and then running it thru the printer .. What I figured was that since tissue paper is so thin, I could trace it – Val reminded me not to use pencil so I wouldn’t permanently mark my thread or quilt. Good advice and one I hadn’t thought of at that point! I decided that I would bypass the whole thing by paper-clipping the tissue sheets (6 in this stack) with the original on top and then stitch that way .. coo it worked!! As you can see it’s pretty faint here but still seeable .. 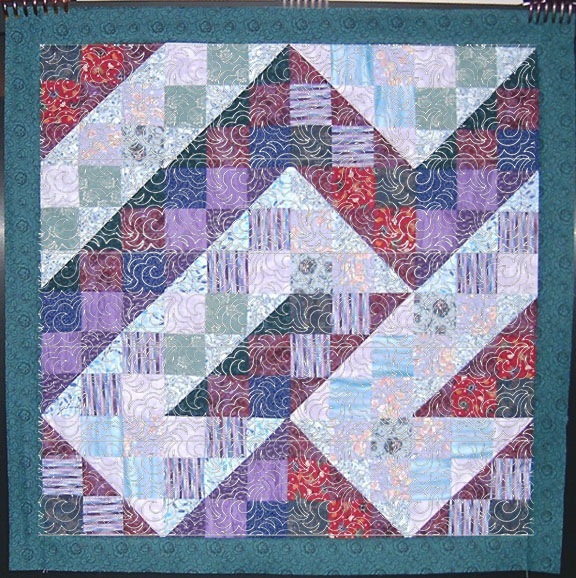 I put it on the quilt and it was rather iffy – but I figured that I went this far, I would test it .. 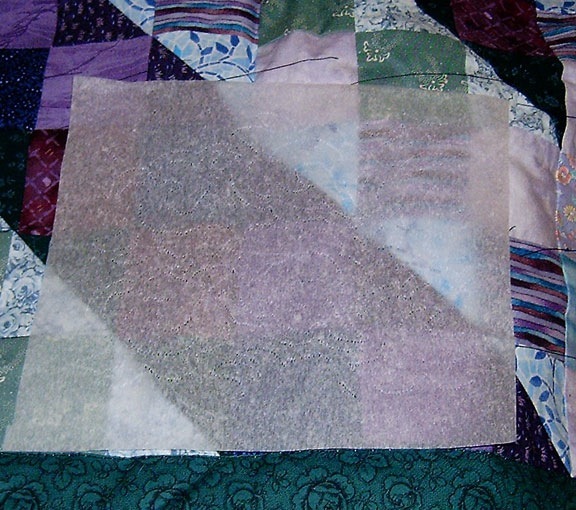 I used a few dabs of glue from a water soluble glue stitch to stabilize the tissue onto the quilt top. That worked pretty well .. Now this is where things got a wee bit dicey … (this really shouldn’t surprise you should it?? LOL) First mistake .. I started on the bottom right which meant that the majority of the tissue wasn’t visible to me .. specially under the foot, so in effect, I was driving blind and couldn’t see where I was going. The other problem with that is that the tissue was caught by the back of my foot and tore – I tacked it down and was able to keep going – but again, I really couldn’t see what I was doing at all .. I decided to cut my loses at that point instead of pushing thru and give myself MORE ripping (I really HATE ripping out quilting stitches .. specially freemotion stitches) The tissue came off pretty easily .. getting it wet will get it off much easier too. So if there is any left, I’m confident that it will all come out in the wash – maybe even using a damp cloth would work too. This is a pic of it totally untrimmed with my threads still going every which way. As you can see this looks nothing like it’s supposed to – not even close! This is my mock up of what it’s supposed to look like when quilted – my first itty bitty attempt isn’t even close to it .. is it going to look exact .. nope .. but I’m hoping that it will get pretty close to it! 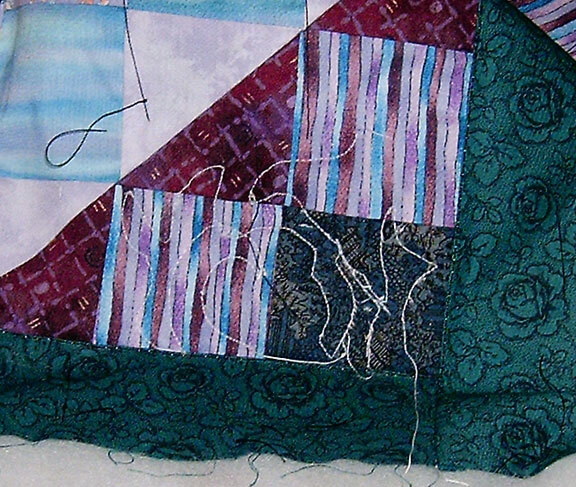 Do NOT start at the bottom right or left corners .. start at the top corners of the quilt and push it thru the machine instead of pulling ..
Keep an eye on the tissue paper near the back of the foot, it will tear! Check to ensure that your ink is NOT water soluble or else you will end up with it on your quilt if you use water to remove the tissue paper. I can’t think of anything else to add to this list – I know my glue stick is water soluble, and I know that my ink isn’t water soluble as I print out my quilt labels. I’ll work on Plan B tomorrow and let you guys know how that goes .. I’ve some ripping to do first AND I have to print on the tissue paper .. that is going to be a pain!! So, did you learn anything new today / this week??? Have a great weekend!! 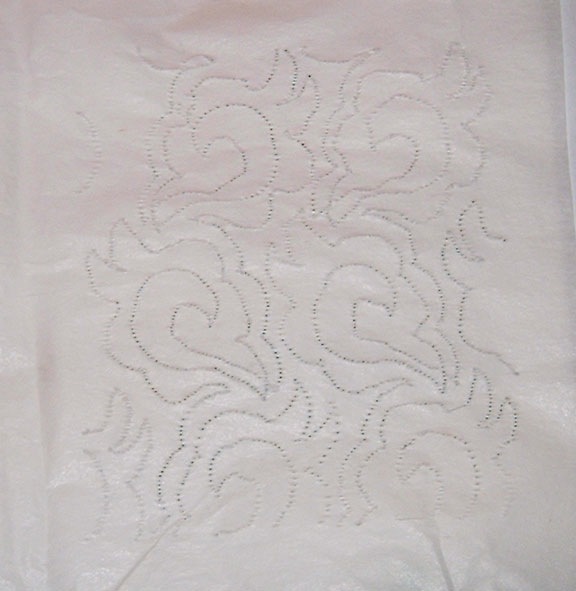 I loved your story..suggestions are: use large tracing paper instead of tissue paper and trace pattern on top sheet and then sew on sewing machine with no thread in needle to make holes. I have never done this but have read this in lots of places. It seems like Val was talking about using…. the paper like they have on exam tables at the doctor’s office…. which is a bit heftier than tissue, so Alberta’s tracing paper might just be the ticket – although it might take more sheets. Or onionskin typing paper, which you might be able to get at WallyWorld. I’m thinking they’d be smaller but those squares of sandwich paper that some people recommend for string quilting would probably work, as well, tho’ they’d be smaller – which might NOT be all bad because there’s less chance of the end of the template getting torn if it’s smaller??? Just to clarify – you want to use your washout marker so that any transfer will wash out. The quilter’s papers leave very few itty bits of paper behind and are worth the money for that alone , imo. I don’t free motion. 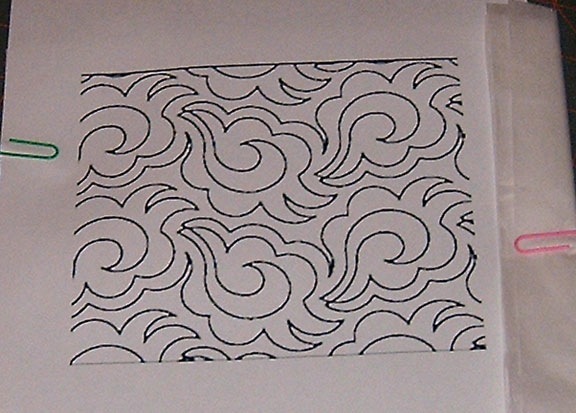 I’ve always used this method for continuous line block motifs and borders that I slowly stitch on and turn as I go. I hope you find a way to make it work. I’ll try the printing on the tissue paper and see how that goes .. I might get lucky .. Altho the loop-de-loops might cause some tearing, could use a bit more glue maybe??? My printer ink is NOT water soluble so it’s not likely to transfer and I’m betting that the tissue paper disintegrates with water more completely than regular bonded paper .. When I use this method I use printer paper, any paper is o.k. And I stack a few and sew though the pattern on top with my needle with no thread. Then when you quilt them on you should use a small stitch so the paper will tear off easier but I usually use 2.8 length on mine 🙂 Hope this helps!